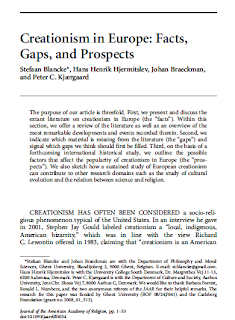 There is a new paper out in the Journal of the Academy of Religion that provides a broad overview of the various creationist movements in Europe. 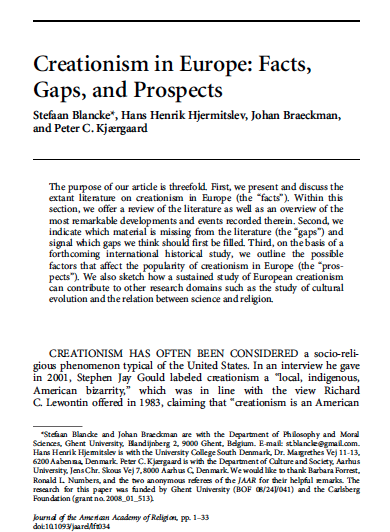 The title of the paper is Creationism in Europe: Facts, Gaps and Prospects (you can download the full paper!) and it is authored by Stefaan Blancke, Hans Henrik Hjermitslev, Johan Braeckman, and Peter Kjaergaard. The same team is also behind a follow-up edited volume on this topic coming out in 2014, where I have also contributed a chapter on Islamic Creationism in Europe, and Martin Reixinger has a chapter on Turkey. Saturday Video: "The Final Moments of Karl Brant"